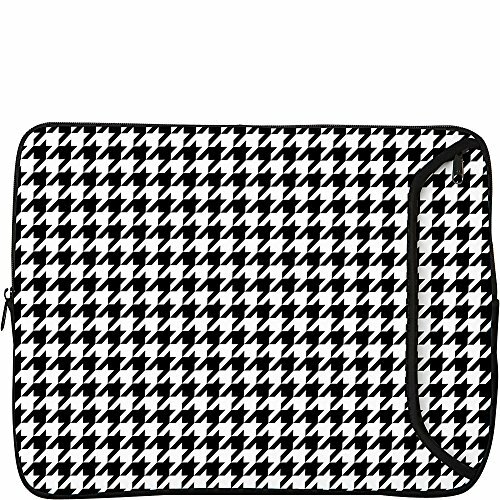 Protect your 15-Inch laptop in the sleek and stylish Hounds Tooth laptop sleeve. This laptop case is made of thick, durable neoprene rubber that cushions your mobile device for maximum moisture, shock and scratch protection. The zippered external pocket allows you to securely carry items (power cord, USB, etc.) without scratching your laptop or tablet. This Designer Sleeves laptop bag is made utilizing our patented SublipreneTM manufacturing process which means the image will never crack or peel off. In addition, the ink is created with UV inhibitors virtually eliminating product fading. Internal pocket dimensions: 10.3 x 14.625 x 1.